The UniNet iColor 500 has been a big hit with our customers by bringing more versatility and economy to laser transfer T-shirt printing. 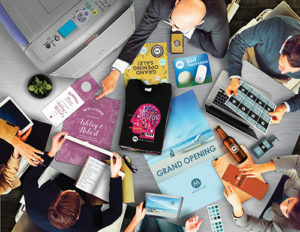 The iColor 500 comes with a unique five toner color set including CMYK plus Fluorescent White, so it produces both dark black and bright white prints and transfers. The iColor 500 has impressed most customers at our Open House and trade show events. However, there were a few ‘Yesbuts’. ‘Yes, but I want to print bigger images’. Okay, Mr. YesBut. 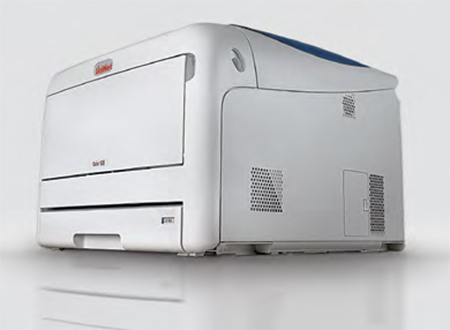 May we interest you in the iColor 600 LED laser transfer printer? The iColor 600 offers all the features of the iColor 500 and expands it to a Tabloid size printer. But the iColor 600 is more than a bigger iColor 500. It comes bundled with smart software and new toner options that create exciting new print and transfer applications. What makes the iColor 600 such an exciting new product? The UniNet iColor 600 LED laser printer expands the envelope by accommodating heat transfer materials up to 11″ x 17″. It can also print on standard media up to 13″ x 19″ and 11.6″ x 52″ banners. Despite the larger output, the iColor 600 isn’t as bulky as the other tabloid sized white toner solution. It weighs less than half as much as an OKI PRO 920WT. 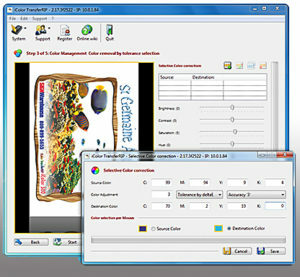 The iColor 600 comes bundled with the newest version of iColor TransferRIP software. TransferRIP enables single-pass white toner printing with the CMYFW toner set (process color plus Fluorescent White). TransferRIP is compatible with Windows 7/8/10. As in the iColor 500, TransferRIP now includes a color mapping function that enables two variations of one pass white toner printing with the CMY +FW toner set. Print with white over color to create opaque transfers for decorating dark apparel. Print white under color for creating opaque vivid color prints on clear media such as static cling or waterslide decals. The patented iColor TransferRIP color mapping function makes the iColor 600 the most versatile tabloid size laser transfer solution on the market. Speaking of versatility, the iColor 600’s applications include clear and security toner. Clear toner is ideal for laminating prints with an abrasion resistant coating. Security toner is an iColor exclusive technology with applications in many areas. It’s a discrete method of enabling authentication of printed documents. The security formula is blended into the Yellow toner and drum. As long as there is dense yellow in the printed image, a scannable code can be embedded in the print. When a security reader is passed over the print, the reader will beep and light up indicating that the document is genuine. This is a great way to prevent unauthorized duplication of things like concert and sporting event tickets. The iColor 600 uses the same laser transfer media as the iColor 500 and Oki WT printers. Decorating white apparel is done with one-step self-weeding papers like EnduraTRANS 1-Step Transfer Paper. Decorating dark garments requires the use of two-step self-weeding papers such as UniNet Premium paper, iColor Standard 2-Step paper, or Forever Laser Dark A-Foil & B-Paper. UniNet Premium paper offers best-in-class washability ratings of 100 wash cycles. Decorating hard surface items like ceramic tiles and magnets can be done with iColor Hard Surface transfer paper and an iColor silicone pad. Paper for office documents, business cards, and banners can be obtained from your favorite office supplies retailer. The iColor 600’s five color toner set produces bold color and rich black in standard document printing colorful T-shirt transfers on white and gray apparel. The Fluorescent White offers great opacity for decorating dark garments and clear film. The optional Fluorescent CMY upgrade offers the added ‘Wow’ factor of shirts that glow under UV black light. This application is ideal for night club, novelty, and souvenir apparel. These features make the iColor 600 the most versatile tabloid size LED laser printer on the market. 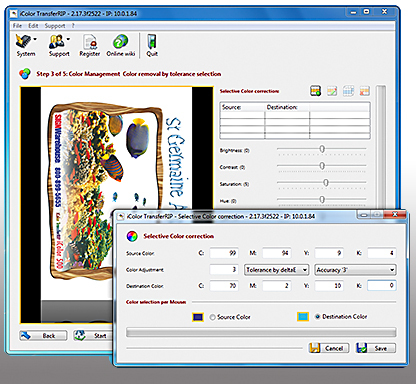 The bundled iColor TransferRIP software is a $649.00 value and supports single-pass white toner printing for decorating darks apparel and transparent media. For these applications, the White toner cartridges is loaded in place of the Black cartridge. The iColor 600 benefits from UniNet expertise in toner formulations and offers the brightest, most opaque white toner on the market as well as innovative clear and security toner options. The new and improved TransferRIP produces more vivid color and darker composite black. It also includes better layout tools, one click rasterizing, and faster print times. It all adds up to a more efficient engine for commercial T-shirt production. Like its little brother, the iColor 600 is capable of a myriad of exciting and profitable direct print and transfer applications. Here’s a quick summary of what you can do with one. Application on various fabrics including cotton, polyester, cotton-poly blends, canvas, and more. Brilliant UV black light shirts from the available Fluorescent CMY toner upgrade. Waterslide decals for decorative and hobby projects like candles, RC cars, etc. Outstanding value is one of the iColor Series advantages. The iColor 600 does not disappoint. The iColor 600 economy package, including the printer, TransferRIP software, starter toner set and paper rings up at a miserly $6,995.00. That’s over $1,100 less than a similarly-equipped OKI Pro 920WT. And you get the full benefit of CMYK printing plus fluorescent White. That package assumes you already own a good swing away heat press (Clam shell presses don’t work well with laser transfer paper). If you’re starting from scratch, you can opt for the Complete package and equip yourself with everything you need for just under $10,500. Or choose from one of our other starter packages. Or call 800-899-5655 and we’ll help you create something just for your needs and budget.